We here at Gavel and Spoon try to not only bring you riveting tales of our eating and cooking adventures but also any spicy current events from the foodie world. Today, as a special Fathers’ Day treat and to prove that we truly have our fingers on the pulse of the culinary universe I bring you an expose on a national news story. http://www.huffingtonpost.com/2011/06/13/bananas-foster-explodes-injures-four_n_875820.html. 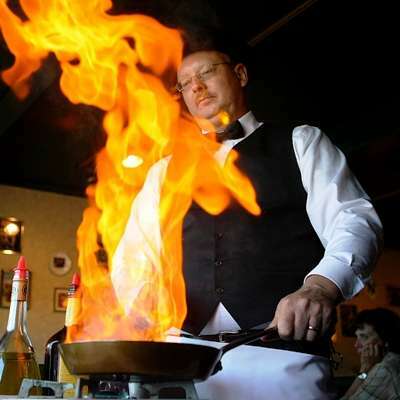 The story is basically this: in a Florida restaurant that specializes in Bananas Fosters prepared tableside, a woman sustained severe burns when the server preparing the flambéed dessert CAUGHT THE WOMAN ON FIRE. Crazy, right? You want to know what is even crazier? Me, this girl, Ms. Melba Toast worked at this very restaurant. This was, of course, in my former life as a waitress and ok I admit it wasn’t this very restaurant, it was a sister restaurant to the scene of the crime. But same owners, similar menu, even some of the same employees, and most importantly, the very same blazing bananas bonanza. At the ripe age of 19 I began working at this sister restaurant (which I will now refer to as Bellyhaa) and it was around that time that the owners took a trip toNew Orleans. There, the owners, in their infinite wisdom, decided that like the famous and fabulous Nawlins’ institution, Brennan’s, Bellyhaa also should offer tableside Bananas Fosters as a dessert option. What these people obviously did not consider was Brennans’ entrusts professional, career servers working in a slow, controlled, upscale restaurant to set a dish on fire a few feet in front of their guests faces. Whereas, the owners of Bellyhaa intended to put this task in the hands of overworked single mothers, dumbass 20 year olds who struggled with such notions as medium rare and over easy, and of course your restaurant stand-bys… drug addicts. Moreover, they did not consider that their restaurant, a glorified beach bar, was overrun with demanding tourists, families with screaming children, and locals who just couldn’t resist a late night barroom brawls despite the fact the owners installed a pathetic wine room and put bottles of olive oil on the tables in an effort to increase the classiness of the place. Oh and did I mention that Bellyhaa was a restaurant housed in a renovated beach house made completely out of wood and decorated with loose, flammable Jimmy Buffet memorabilia hanging off the ceiling and walls? It was about a month into the Bananas Fosters Experiment at Bellyhaa when I first discovered my entrepreneurial spirit. As one of the only servers brave enough to master the BF, I started charging my fellow servers 10 bucks a pop to make their tables dessert while they stood back, at a safe distance, and watched half in awe half in terror because we all knew the literal Molotov cocktail the owners were concocting with this death defying dessert. On one particular busy Saturday night when my BF side business was booming, I parked the BF cart next to one table around closing time and for what seemed to be about the 20th time lit the burner and started the BF dance. Just as I approached the big finale, poured the 151 rum, pulled the pan away from the burner, lit the pan aflame (which was incidentally the only BF pan we had in the whole place and which had been furiously washed between each BF order),the pan, still wet from its last washing, slipped right out of my hand- and in ridiculous movie style slow motion-fell to the wooden planks on the floor. After my heart started beating again, the server I was collecting the $10 from stopped screaming, and manager’s life ceased flashing before his eyes- we all noticed that, thankfully, the minute the pan hit the floor, the flame went out. Every time I read about a new cooking technique or some time-tested tradition that I haven’t tried before, I am practically jumping out of my skin with excitement to try it. Except flambéing. So, the moral of this story is this: as a lawyer I can tell you that an open flame in a restaurant inches away from grandma on her 90th birthday or a group of drunken divorcees and a pile of cosmopolitans is not a good idea. As a former Bellyhaa employee who still feels the aftershocks of my BF post traumatic stress disorder, I can confirm that. As an aspiring foodie… well my inner lawyer and server trumps that fool 10 to 1 on this issue. So if you know of a great recipe that you think I should try or that Gavel and Spoon should feature and it involves setting the ingredients on fire, don’t bother. I won’t do it. And really, given what I just told you, could you blame me?